Over the next few days, I will post in quick succession to bring you up to date on recent happenings. Just a quick update on things since the last post. All point blades and Cobalt motors have been installed in the UP yard. For a change of scenery, I have started some wiring of the UP yard as well. This includes cutting gaps for future detection sections, running bus wires and connecting droppers from the rail. Over the next few weeks, I hope to complete the point blades, motors and wiring in the DOWN yard. I have just added a new page to the main blog menu, titled “About Proto-87”. It is some information that I had on my Aus Proto87 Supplies website, and since it will cease to exist by the end of the month, I thought I had better replicate the info here. Well, the workbench is finally up with networked PC and 2nd phone all connected. I can now start unpacking some modelling stuff that’s remained in boxes since the move. This will inspire me to start back on some modelling, as I need to start detailing some more wagons before our next showing of Bowen Creek. On the new painted wall above the bench, I only thought the other day, that I might try and mount some of my various railway paraphernalia that I have accumulated over the years. They consist of various cast iron signs and other stuff. We’ll see. Today the second coat of paint went on the walls in the modelling bench area. Tomorrow, I’ll erect the work bench and get all that finalised. I think the light colour will help with lighting levels in this area, as in the future, directly opposite the bench will be layout benchwork, so it could end up being a rather dark area if the walls were a dark colour. There was no need for a “sky blue” colour here, as there will not be any layout above the workbench. I am close to also completing the trackplan design, as I have realised that I couldn’t have a grade either side of Ardglen, so Kankool and Ardglen will now have to be at the same level, but on opposite sides of the room. All will be revealed soon! Again, it’s been quite a while since my last post, but things are beginning to happen in the train room. 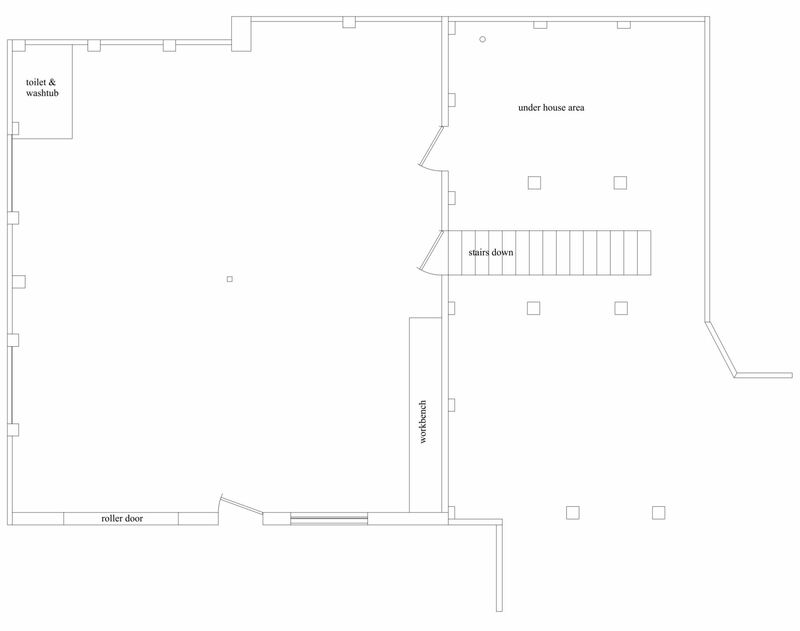 Over the last few months, I have been redesigning the layout to fit in the new layout room in the new house. It has been rather frustrating at times due to the fact I have had problems with trying to fit the layout into a multi deck design, but due to there being a rising and falling grade either side of Ardglen, there have been issues with clearances between decks and I am still at a point where the design is not working. I am up to Version 7 of the design at the moment, but I think I am pretty close to getting it right. I am also hoping to open up another small area under the house to add to the main room. 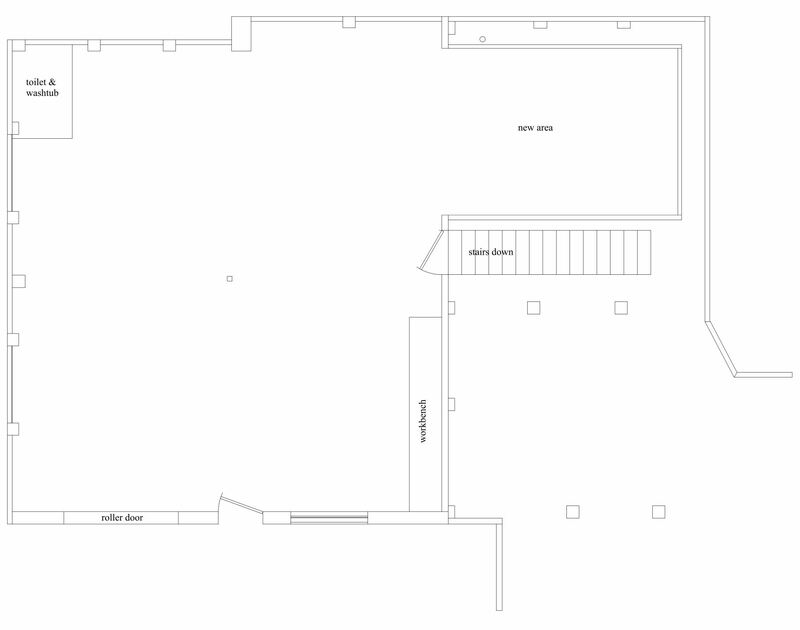 Click here for a drawing showing the current room plan. This involves quite a lot of work with dirt to be excavated, two brick piers to be removed and the existing timber bearer replaced with a steel beam. Click here for a second drawing showing the proposed future addition. There will also be drainage issues to deal with, but my builder says it’s all possible, but I need to get a structural engineer to look at the job. So, this has been put on hold for the time being until the layout design is finalised, as I want to make sure if I open up this space that it will be of benefit and not just a waste of time and money. A few days ago I started work on an area that will become the modelling bench and second computer station. I was able to salvage a bench I had in the previous house. So, I have done all the cabling for power and data, and today I put the first coat of paint on some of the brick walls. Hopefully the second coat will go on tomorrow, then attach the bench to the wall and terminate the power and data cables. I thought I would share some scenes of the Liverpool Range area that I intend to model. The overall aim of the layout is to reproduce certain scenes and specific trains within a set time period. Even though I enjoy running the trains, my aim is to re-create a prototype scene from a photograph in model form. As mentioned previously, the layout will be set in a period from April 1979 to March 1983. I have picked out twenty two specific trains in specific locations on specific days. Below are three of these scenes. All these images reproduced with kind permission from Train Hobby Publications and the photographer. The first trackplan that I had posted a link to in my original post, showed an initial design for the entry into the storage yards. Because these are located beneath the main layout, approximately 150mm, this design produced too steep a grade. So, I relocated the entry further back around the curve, which gave a longer distance to the start of the yard throats. This produced a 2.8% grade, which equates to about a 1 in 35 grade. This still may be too steep, so I may have to shorten the length of the storage tracks. Anyway, here is the amended trackplan. This is my first attempt at a blog, but here goes. I thought I would start a blog showing the impending start of my model railway. But first, a bit about myself. I am a 39 year old male, single, but currently enjoying the company of a wonderful woman and her 5 year old son. I live in Port Macquarie on the mid north coast of New South Wales, Australia. I am currently employed as a Network Operator with Country Energy, the local electricity distributor. I have been modelling the railways of NSW for over 20 years now, but until I purchased my current home back in 2005, I did not have the space to start building my model railway. Most of the downstairs area has been dedicated to my model railway. When I purchased the house, the section underneath was just a big empty space with a concrete floor. There was no internal access to this area from the rest of the house, so a staircase from the garage was installed. This work started early 2006 and during the next 12 months, the area was framed and lined, giving the result below. So now I have a fully lined, carpeted and airconditioned room for my model railway. Over the last year or so, I have spent a long time desiging the layout, using a program called 3rd PlanIt. It has been a fun process, trying to fit the whole thing in. The program has been fantastic, as you can use it as just a basic 2D planning tool, or you can go the whole hog and add terrain, buildings etc. I just wanted to use it to make sure curves etc would fit in the room. The program has the facility of drawing easements or transition curves, which are essential for reliable and smooth flowing trackwork. Click here for a diagram that has been produced with 3rd PlanIt showing my final layout design. The page opens up in a new window. The layout will be based on a section of the NSWR Main North line between Kankool and Pangela in the Liverpool Ranges. Ardglen is at the top of 1 in 40 grades in both the UP and DOWN directions. The era will be set between late 1979 to 1983. Typical trains that will be modelled are block coal and wheat as well as passenger and general freight. The layout will be DCC controlled. It will be built to Proto87 track and wheel standards, which are scaled down from prototype dimensions to 1:87.1 . If you would like to know a bit more about Proto87, there are some sites listed in my Links section of this blog. OK. That’s a brief introduction to what I am doing. I hope to actually start construction of some benchwork in the next 12 months, but I am in no hurry. I will try to keep this blog up to date with progress.